DID YOU KNOW THAT STARS IN THE SKY CAN SOMETIMES MAKE SHAPES AND PATTERNS? THESE ARE CALLED CONSTELLATIONS. LET’S SEE IF YOU CAN RECOGNISE THESE FAMOUS ONES. Ursa Major means “big bear” in Latin. Within Ursa Major lies the Big Dipper. This constellation is usually visible at night. Many people use it as a compass because it always points north. This constellation has a great mythological history. It has been written about by philosophers and poets for centuries. Good news! The latest issue of Hot English (181 – the June issue) is out now! Learn over 300 useful words and expressions and improve your listening skills with Learn Hot English! 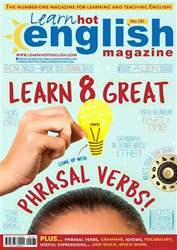 This month: Learn 8 really useful phrasal verbs! Learn how to use these eight phrasal verbs and really impress your friends and colleagues. Plus, 12 useful words for talking about parties, 10 useful words for talking about renting a flat, 10 useful words and expressions for talking about music, 8 useful terms for describing similar things, “pot” idioms, “work” phrasal verbs... plus: Grammar – relations & relationships and articles. TV – a clip from Will and Grace. Health – unhealthy salads. Quiz – What planet are you? Phone English – the electronic store. Science – where do planets get their names? History – were the lunar landings a hoax? Cinema – space films. Movies – Star Trek. Astrology – star signs. Festivals – Sci-Fi London. Exercise – the couch potato. Stars – Mickey Rourke. Crime – ridiculous lawsuits. Language – body words. Slang – learn some useful slang terms! AND LOTS, LOTS MORE! By reading and listening to all this great content, you'll improve your English reading and listening skills and learn up to 300 useful words or expressions. Plus, you'll get a better job and pass English-language exams more easily. Guaranteed! 8 REALLY USEFUL PHRASAL VERBS! WHERE DO PLANETS GET THEIR NAMES? WHY ISN'T PLUTO A PLANET ? DID THE LUNAR LANDINGS REALLY HAPPEN? WHY YOU SHOULD GO TO THE SCI-FI LONDON FESTIVAL! Mickey Rourke: back from the darkness!